Exactly how much water should a cat drink every day and is your feline friend staying properly hydrated? We’ve got some parameters and some tips to keep your cat properly hydrated. Famed veterinarian and author James Herriot has noted that “cats are connoisseurs of comfort.” When we think of comfort for our cats, items like soft cat beds and tasty cat treats come to mind. But we should also think about a clean full bowl of water. 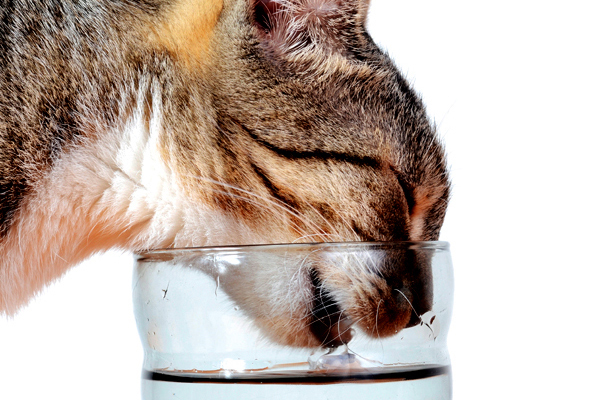 Hydration is an extremely important part of your cat’s overall health. Exactly how much water should a cat drink every day? And how can you make sure your feline is getting enough water? How much water should a cat drink? It depends on a few factors. How much water should a cat drink? The answer varies. Photography ©GlobalP | Getty Images. How much water should a cat drink? The amount of water consumption depends on a variety of factors, including the size of your cat, the time of year and whether your cat’s diet includes wet cat food or dry cat food only. If cats are given dry food only, they will require significantly more supplemental water to stay acceptably hydrated. Normally, a cat will require 2-4 ounces of fresh water in addition to his food. Dry food is only 10 percent water, while canned is approximately 80 percent water. 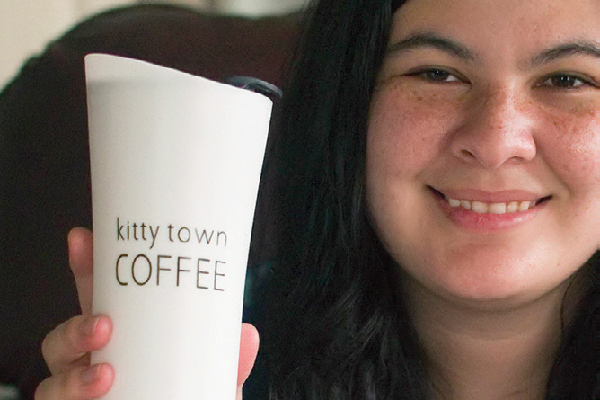 So obviously your cat is going to drink a lot more water if you are providing dry food only. How Can I Tell If My Cat Is Getting Enough Water? Skin elasticity. Gently pull the skin at the base of your cat’s neck (scruff). The skin should spring back when you release it. If it does not, your cat might not be getting enough water. A shiny coat without dry flakes is a sign of hydration. Your cat should exhibit normal physical activity and not be overly lethargic. 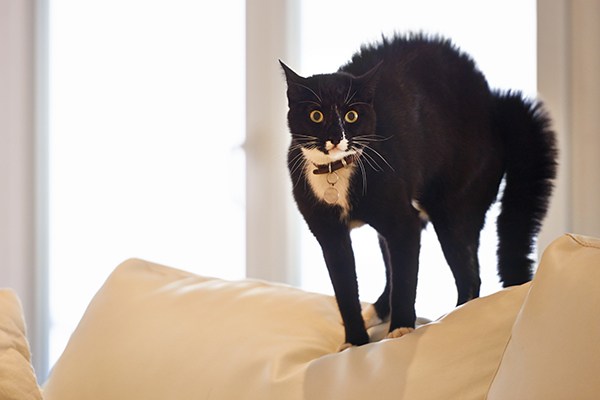 Is your cat urinating 2-3 times per day? You can tell if this is happening by checking your cat’s litter box for medium-sized clumps. What Can I Do To Encourage My Cat To Drink More Water? Sprinkle a little more water on top of your pet’s canned food. This is not recommended for dry food as it may cause it to spoil more rapidly. Try using glass or stainless steel water bowls. Sometimes plastic leaves a taste that cats don’t like. Plastic cat bowls may also cause cat acne. Always make sure the water is fresh and clean. Refresh your cat’s water bowl daily. Use filtered water instead of tap water. The latter can be heavily chlorinated or have too high a concentration of minerals. When asking, “How much water should a cat drink,” it’s very important to pay attention to your cat’s “normal” water consumption and take note if that amount happens to change. Any significant increase or decrease in your cat’s daily water intake could be a sign of illness. A cat drinking too much water or too little water could be indicative of a urinary cystitis (bladder infection), tapeworm infestation, diabetes or hyperthyroidism. It’s time for a trip to your vet if you notice excessive changes in your cat’s daily water intake. Many cats, while not wanting to be completely immersed in water, are fascinated by running water. If you don’t have a cat that likes to play with a dripping faucet or watch water being flushed down a toilet, you’ve probably seen a video of one on the Internet. Purchasing an automatic water fountain may be one way to get your cat to consume more water. 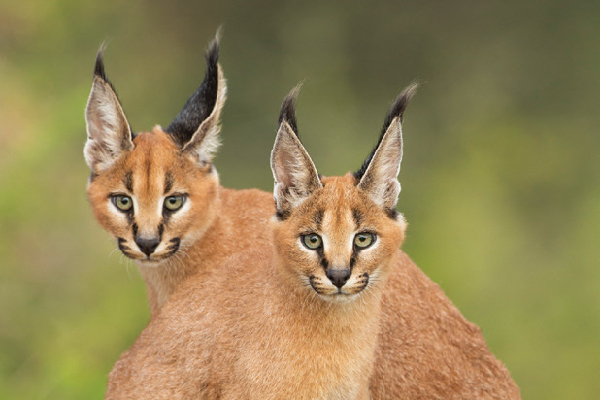 Some cats don’t like the taste of “hard” water which is high in concentrates of mineral salts. Try offering distilled or filtered water instead. It might be necessary to rinse your cat’s water bowl a couple of times a day during the warmer months of the year when bacteria can form quickly. 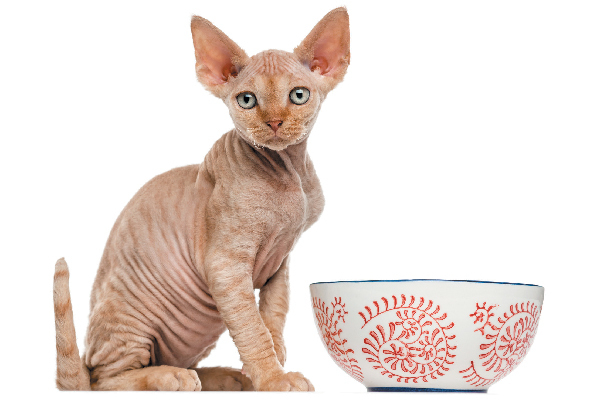 Benjamin Franklin once noted in Poor Richard’s almanac that “when the well is dry, we know the worth of water.” It’s not necessary to wait that long to know what it’s worth for your cat or kitten. Make sure that water bowl is filled to the brim with fresh clean water every day and you’ll contribute greatly to your cat’s health. Thumbnail: Photography by sarkao / Shutterstock. July is the CHILL ZONE on Catster.com! 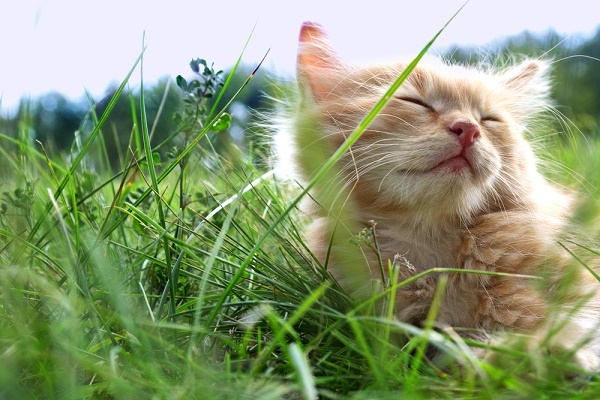 Learn how to keep your cat cool, calm and collected this summer with articles on preventing summer mishaps, staving off stress and more. This piece was originally published in 2009. Some really prize articles on this site, bookmarked. My cat drinks about 1 dl of water every day. My vet said that is ok. Great article I like it! put up is wrutten via him as nobody else recognise such unique approximately my problem. Yoou are incredible! Thank you! My daughter rescued an abused kitten. She is drinking water and eating well. The vet said she is about 3 months old. We cage her at night but if she puts her food and water bowls in with her and a litter box she has kitty litter everywhere including in her bowls. My question is would it be okay to not put her bowls in the cage overnight? I don’t want to dehydrate her but I don’t think getting kitty litter in her bowls is very healthy. Thanks for reaching out! We suggest contacting your vet with this question to see what is best for your kitten. My male inside cat had a spell last week with vomiting, gaging, bile throw up for 24 hours. Completely stopped eating, drinking water. Had a complete check up with vet, x-rays, blood tests, etc. Absolutely nothing bad showed up. They gave him IV fluids, observed him 2 days/nights. He wouldn’t eat or drink. Returned home. He acts normal, still very sweet, cuddles up, sleeps with me. But still hasn’t returned to eating or drinking on his own. I’ve been syringing water in his mouth for past 24 hrs. Soften food he is used to eating & crushing some in different bowl. No results. He has been home now 3 1/2 days. Ode To SIMON’s DRINKING PROBLEM … It’s clear dear cat you’ve had a water drink / For it hangs thick and low from your thin chin / As a large drop through which light rays glisten / Then a flicker of your tongue’s tip quite pink / Comes with a sway of your tail, its kink / So noticed like that water drop again / (And you without a little silk napkin) / Your habit’s one endearingly distinct. // Plus your drinking problem leaves us no stink / Like old food stuff or hard liquor like gin / And into a bad thing you didn’t sink / You’ve committed naught resembling a sin / Habits can still be dropped in an eye’s blink / While having you near’s my mind’s medicine. Our cat, Micro, likes to eat iceberg lettuce. I once watched him eat, (a little at a time), a whole leaf. Amazing. The reason I’m writing though, is his usual drinking method. He sticks his paw into the water and licks it off. Sometimes, not always, he will drink normally, for a cat, (lap, lap lap). but more often by licking a wet paw. My Wife thinks that feral mothers teach their kittens to clean the scum off of water in the wild, but our Micro came to us a six weeks, his eyes had just opened. I don’t think my Wife is correct, but don’t tell her I said so, please. Also, Micro, and one of his siblings, but not all of them, was born with an “impacted tail”. I call it this as he seems to have all of his nerves and thinks. If he gets a fright, (outdoor loud noise, foe example), his tail will fluff up like normal, except it’s only about one and a half inches and turns him into a bunny-tailed cat. He is also entirely Black except for a tiny Gray “soul patch” on his lower lip. When he is in sunlight, his coat shines with Red highlights. Our Vet says this means he is a “True” Black cat. I add chicken broth to my cat’s wet food, change out their water at least twice a day and add a few ice cubes on hot days. I add water, or chicken broth created when I poach chicken thighs for them as an added treat. Sometimes I buy bone broth and add that. No added veggies, nothing but chicken and a small pinch of kosher salt. Neither one of my two cats would eat a vegetable they could see, lol. Fortunately, they love gravy, so I add about two tablespoons to their small cans of wet food, or to the fresh homemade meat I give them. They turned 8 yesterday, and so far have great vet check-ups and no need for any dental cleanings. Occasionally I add a little colloidial silver or liquid slippery elm to the broth, too. Chicken broth is the clearing liquid you get from boiling a chicken in water. It is often saved, frozen in an ice cube tray, to be used in soups, etc later. Hey. I think ice cubes is not good for the cat. A long time ago, I added 1 ice for my cat, and have a problem with my cats.